I don’t have much of a sweet tooth, but I have to say that a good donut is one of my favorite treats. 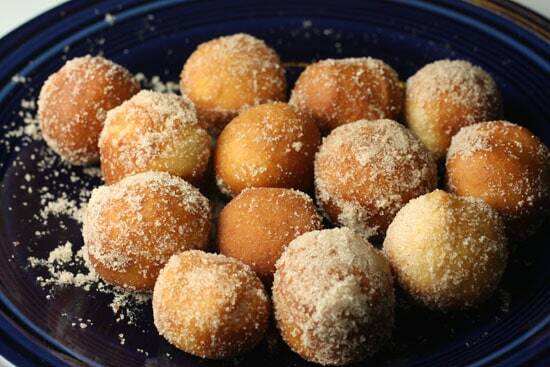 Cake or yeast donuts. 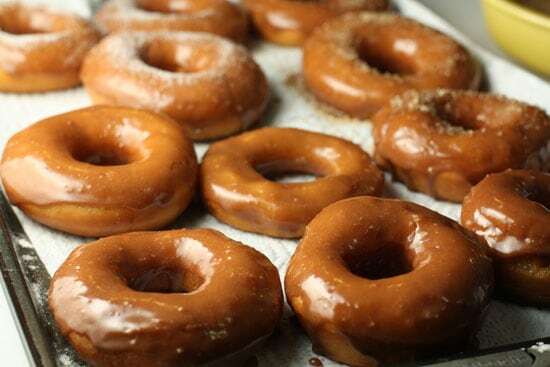 Glazed or filled donuts. I’m not picky at all. That’s why I included a variety in the last poll so people could pick what kind of donut they wanted me to make and I would just oblige. I would’ve been happy with any of the results, but I was especially happy about the yeast type. The end donut is just so light and fluffy. It’s pretty easy to put away a few of these guys. I went with a chocolate glaze for this version for no particular reason except that I knew my coworkers would like chocolate. I thought the glaze was perfect. It wasn’t too thick. Just a nice, shiny coat on top of the donut. Yeasted donuts with a light chocolate glaze. These will make you lots of friends. 1) Add yeast and water to a mixing bowl, stir it and let it sit for 5 minutes. Once it’s bubbling, go ahead and mix in all the other dough ingredients. 2) Mix the dough on low until it comes together in a soft ball. Then mix for 2-3 minutes. You can also stir everything together with a wooden spoon. 3) Add dough to a lightly oiled bowl and sprinkle a bit of flour on top. Cover and let rise for 2 hours. It should more than double in size. 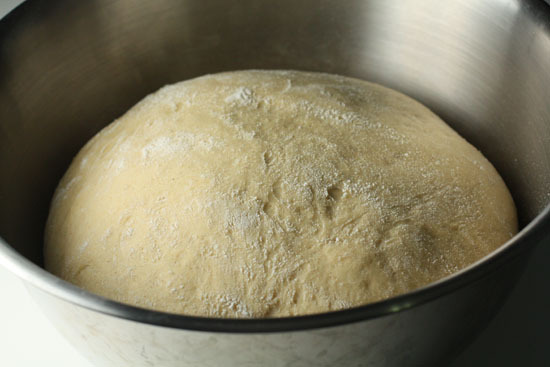 4) Roll your dough out onto a lightly floured surface until it’s 1/2 inch thick. 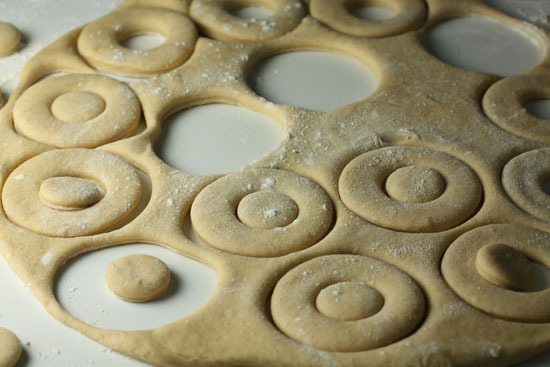 Then use some round cookie cutters to punch out the donuts. You should be able to get at least 12 out of the dough. Feel free to re-roll the dough and make more donuts. 5) Lay donuts on a baking sheet that’s been lightly floured. Let the donuts rise for another 30 minutes. 6) Heat oil in a cast iron skillet until it’s 350 degrees. You don’t need a lot of oil, just about 2 inches of oil in the pan should do the trick. 7) Add a few donuts to the oil and cook for about 1 minute per side. You’ll have to flip the donuts with a spoon or tongs. 8) Remove the donuts and let them cool on some paper towels. 9) For the glaze, melt the butter in a small saucepan and stir in the milk. Then add corn syrup, vanilla, and chocolate until it melts. 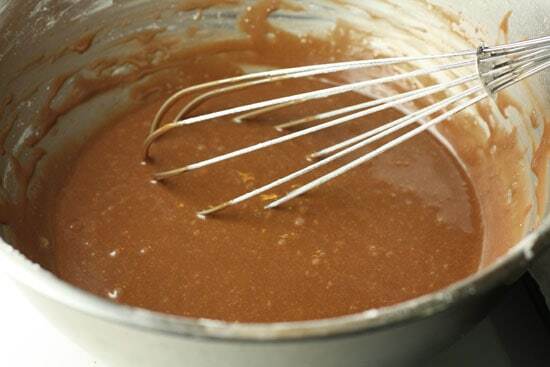 10) Take the mixture off of the heat and whisk in sugar. 11) Dip the donuts in the glaze and sprinkle on any other toppings you want. Eat as soon as possible! Recipe from Gourmet originally, but I got it from Joy the Baker. This dough is pretty easy to pull together actually (especially if you have a mixer). 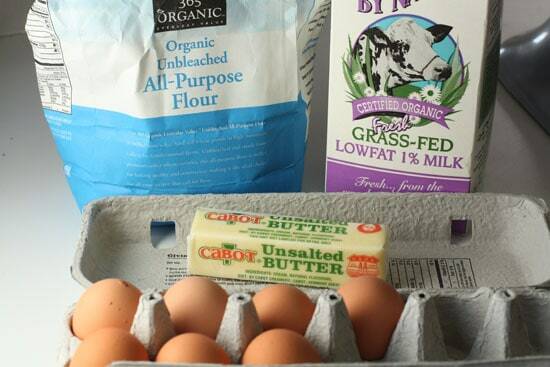 Like a lot of enriched doughs, these are the base ingredients. Since these are yeasted donuts, the first step is to actually make sure your yeast is alive. Honestly, sometimes I bypass this step, but I decided to check it for this recipe. 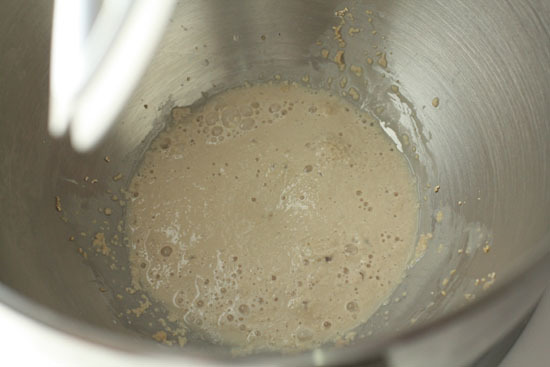 Add your yeast and water to a bowl, stir it together and let it sit for about 5 minutes. If it starts bubbling and foaming, you know you’re in business. If there aren’t any bubbles, you need some new yeast! 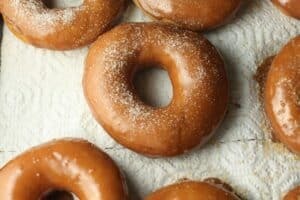 There’s a very small amount of sugar and cinnamon in the dough, but these ingredients plus a bit of salt give the donuts a “something special” flavor. Back to the dough, once your yeast is bubbling, add in all your other dough ingredients. I added my flour last. Then beat it on low until everything comes together in a soft ball. Then increase the speed to medium and beat it for 2-3 minutes until it’s very smooth. If you don’t have a mixer, I’d recommend mixing everything up with a wooden spoon and then kneading the dough for a few minutes until it’s a smooth ball. Add your dough to a lightly oiled bowl and then sprinkle a bit of flour on top. Making these donuts is actually pretty straightforward. Just roll your dough out on a lightly floured surface until it’s about 1/2 inch thick. Then using some round cooking cutters (I used the 3 inch cutter and the 1/2 inch cutter for the holes), just start punching out donuts in the most reasonable fashion. Of course, your goal is to get as many as possible. Most of the donut recipes I read advised against reusing the scraps of dough to make more donuts. But this seemed kind of silly to me so I tried it. After I got as many donuts as I could get out of one sheet, I rerolled my dough and punched out some more donuts. Guess what: People ate them anyway! Once you punch out your donuts, lay them out onto a baking sheet that’s been lightly floured (just so they don’t stick). Let them rise for another 30 minutes. This will make sure they are nice and fluffy when you fry them up. I actually let mine rise for like an hour by accident, but 30 minutes would’ve worked fine I think. The moment of truth. You need to fry these bad boys. And yes you have to fry them. 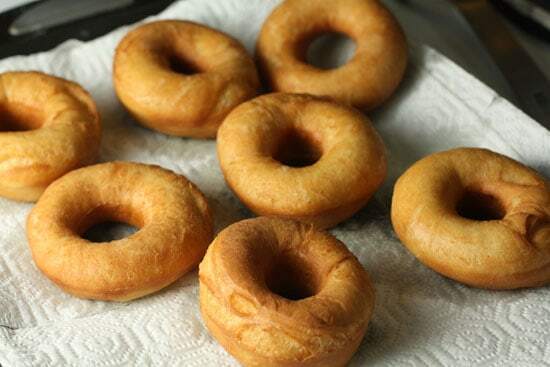 There’s a lot of ways to do a lot of things, but there’s only one way to make good donuts: fry them. I fried mine in a large cast iron skillet. Just add enough oil to measure about 2 inches up the pan. The donuts will float so you only need to cover half a donut at a time. Heat up your oil until it’s about 325-350 degrees. I highly recommend a deep-fry thermometer. They are very cheap and pretty essential if you want to do some good frying. Click the photo to check out the cast iron skillet I recommend! These will fry very quickly. About 1 minute a side should do the trick. Work in batches and use some metal tongs or a wooden spoon to flip them. When they’re done, move them to a baking sheet lined with paper towels to let them drain a bit. They really only take a minute. Don’t forget about the holes! 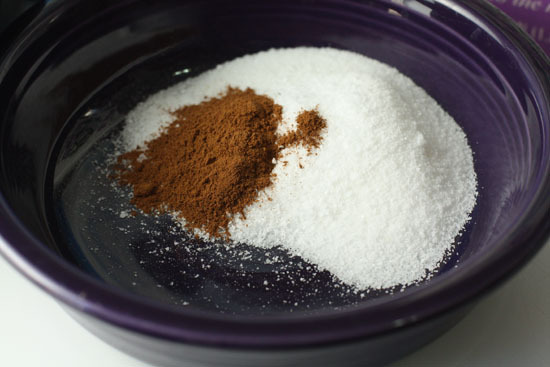 I fried mine up and tossed them right away into a cinnamon sugar mix (1/2 cup sugar to 1 Teaspoon cinnamon). Ok. So you actually want to make the glaze before you make your donuts just because the donuts take no time to fry up. The glaze is super easy to make though. Just melt your butter along with your milk in a small saucepan over low heat (or in a double boiler). Then stir in your corn syrup, vanilla, and chocolate until it’s melted. Then take it off the heat and whisk in your sugar (sift it if you’re concerned with lumps). Easy breezy! Once your donuts cool for a minute or two, go ahead and dip them in the glaze! You can of course sprinkle on any toppings that you want. The only topping I had laying around was some raw sugar so I used that. Not very colorful, but whatever. This guy wasn’t going back to the store just for sprinkles people. It’s really hard to eat just one of these. It should go without saying that these are best to eat as soon as possible. I don’t think I have to tell you this, but these were really good. And to be completely honest, they weren’t that difficult. I was expecting them to be a lot more finicky, but turns out fried dough is probably going to be delicious. Looks yummy. Too bad I'm not eating this kind of stuff right now! I just finished watching Supersize Me and Food, Inc. Although I have to say I do love all the ingredients you use – they arn't your typical supermarket stuff. Ha! Yea… I'm gonna go out on a limb and say that my homemade variety are somewhat healthier for you than the processed store kind just because I'm using whole ingredients. I can't say that with 100% certainty, but it's an educated guess. whoa. i did not want to see that after my morning walk. oh these are fab my friend. These photos are fantastic. I've always been a little intimidated about making donuts…but after looking at these photos…Yum! 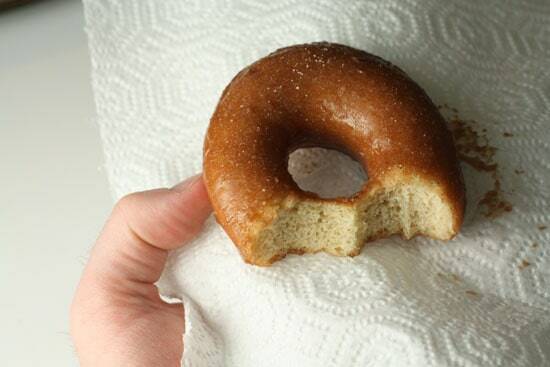 The glaze- the holes– seriously a warm donut is one of the best things ever! I now know what I am doing this weekend. Great looking donuts. Too bad I can't eat them. It's funny how my mind works. 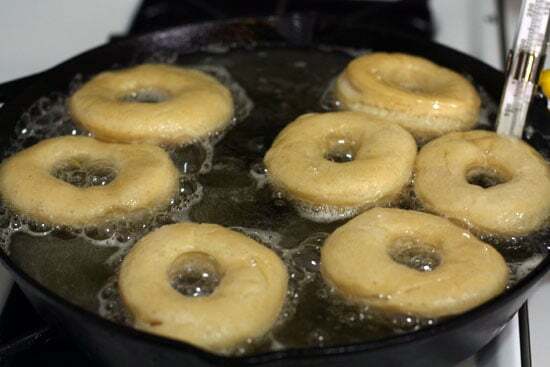 The first thing I thought of when I saw the donuts frying is "what a great way to keep his cast iron pan seasoned!" lol!! Oh! My! God! I'm definitely going to have to whip some of these bad boys up now. I bet that if you used some parchment paper, that they would freeze OK. Just warm one up when you are ready to eat it. The real question is though–do they taste like the real yeast donuts? Or are they more like those yucky "cake" ones? :-) Thanks for posting these! Why do you always get me pregnant with food babies? I would eat the everloving heck out of one of those! JUST LOOK AT THEM! Perfection. For all the baking I do, I've never made yeast donuts. I've got to change that…soon! Great post. Love the step by step pictures and those donuts look delicious! YUM!!! These doughnuts look fantastic. I never get tired of looking at them! Delicious doughnuts, I could make/eat them forever! Oh my… My mouth is watering. I can't take it much more… I have to make these! Thanks! I’m tempted to make these donuts soon- they look delicious and I just love your step by step instructions =] They’re so helpful! Your donuts turned out really pretty! I was so thrilled when Amazon notified me that they had already shipped your book. I wasn’t expecting it for a few more weeks. Unfortunately it looks like I won’t get it in time for our fall breakfast gathering and hike this Saturday, so thanks for the recipe to get me through until the book arrives. Thanks, this works exactly the way you said it would. I don’t at the moment Karin, but here’s a recipe from a blogger I really trust. Tasty, looks delicious, well rounded and formed, with a nice natural texture. These donuts are definitely a reminder to go cook some.